Last Friday, which should have been “my” weekly night out, saw a sudden change of schedule forced by the venue of cricket friends over the week-end asking me to “guide” them around Shizuoka City the next night. To appease the Missus I offered to cook dinner as I would be back home from work before her. Like many women in Japan my (?) half is a pasta addict. I love it, but there is a limit as to how often I’m willing to repast on them. I could have done it the easy way and prepare a “sauce” to be spread over it all, but keeping aware of the tastes of my partner in life, I opted for a dish more adapted to the increasingly hot season: Cold Seafood Pasta Salad. You ladies ought to note the recipe below if you want to convince your men that pasta is great, or encourage them into some originality! This particularly concerns Rowena, Jesse, Melinda, Etsuko, The Leftover Queen and Taste memory Girl (take a break from those cakes, LOL). Fresh herbs: Basil, Italian parsley, dill. All chopped very fine. Quantity to taste. White vinegar, taragon leaves flavoured if possible: one large tablespoon (can be easily rectified later). Any vinegar of your liking will actually do. Walnut oil (very tasty, light and healthy! Hazelnut oil is great, too): as much as will be needed. Heat a large pan full of water with a large pinch of salt for the spaghetti. While the water, and later the pasta are being taken care of, prepare the dressing. In a large bowl drop a vey large tablespoon of basil mustard, a large tablespoon of taragon-flavoured vinegar, a little salt, pepper and soft spices (to be rectified later if needed). Mix well with a whisker. Pour a little walnut oil and mix until smooth. Add more oil in small quantities and repeat the same operation until you have enough dressing. Drop in all the chopped herbs in and mix well. Check and rectify taste with vinegar, salt, pepper and soft spices if necessary. Keep aside. Once the spaghetti are sufficiently cooked, drain them immediately in a sieve and run cold water over them until they have completely cooled down. Drain as much water as possible. Drop them into a large bowl with half of the dressing and the olives. Mix in well. On two large flat plates arrange the sapghetti in the middle so as to form a “little mountain”. Lightly dip the avocado slices into the dressing (use your fingers, it will be easier and faster!) and place them around the spaghetti so as to form a “hedge” to prevent them to spread all over the place. Lightly dip sliced scallops in dressing and place around the avocado with one tomato half on each. Mix in the small leaves (or greens) in dressing and place them on top of the spaghetti as to cover them. 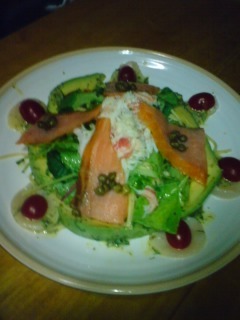 Season the crab meat with wahtever dressing is left and place it on top of leaves. Dip the smoked salmon slices into lemon juice, place them around so as to have their tips just under the crab. Place capers on each slice. Tip: do everything at the last moment (when the Missus or the MOTH is having a shower back from work or enjoying aperitif). Otherwise, the dressing will “cook” the salad!